Hey everyone! 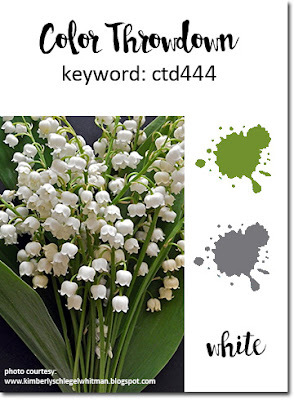 It's Wednesday, so that means it's time for a new Color Throwdown Challenge. Jodi has some fabulous colors for us: navy, pink, golden yellow and white! Isn't that bedding gorgeous?! I knew right away I wanted to use Altenew's Vintage Flowers stamp set and matching dies. 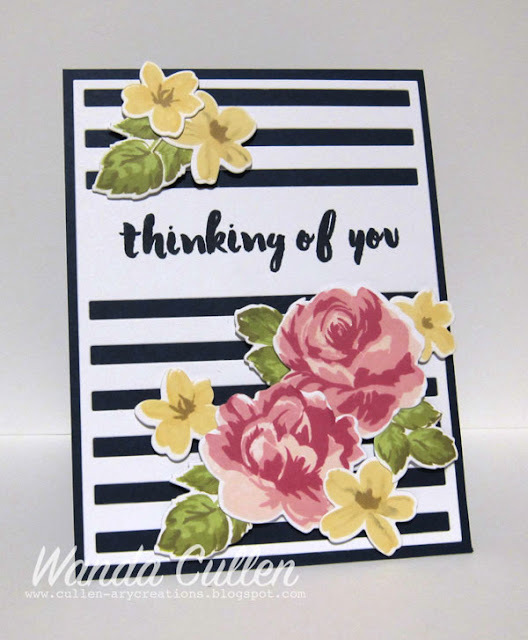 Love the dimension of the florals with the 3 step stamping! 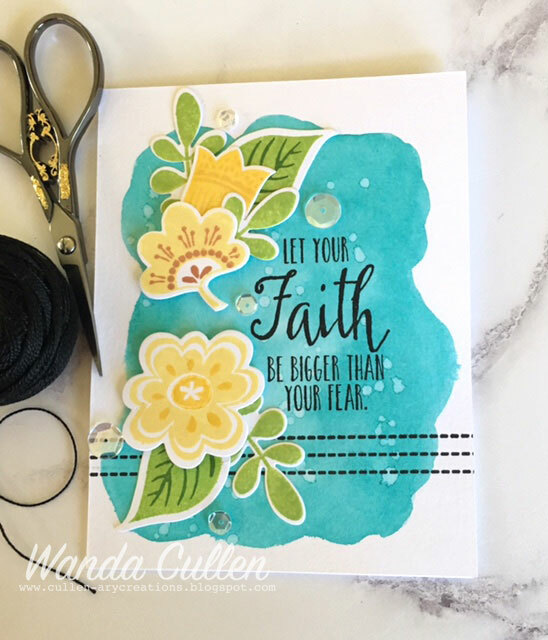 The sentiment is from Altenew's Painted Greeting set...LOVE that font! INK: Night of Navy by SU; Falling Star, Hayride, Old Gold, Shell Pink, Little Piggy, Sweet Gelato, Beanstalk, Last Leaf, Appletini by WPlus9. DIES: Vintage Flowers (Altenew), Striped Sentiment Strip Cover Plate Die-Namics (My Favorite Things). 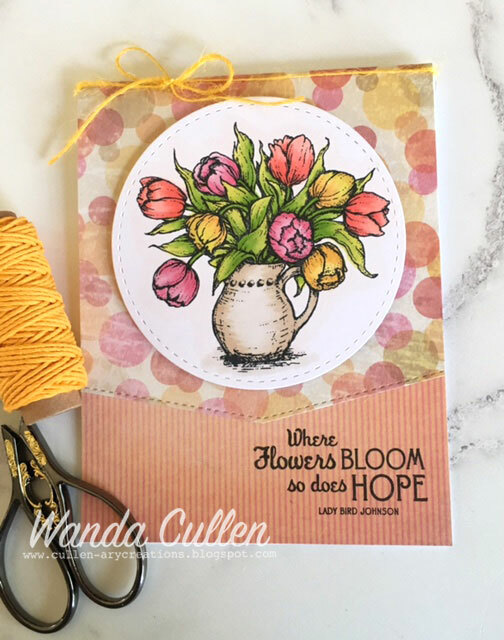 STAMPS: Flashy Florals, Big Greetings and Burlap Background by My Favorite Things. INK: Sweet Sugarplum, Wild Wasabi, Garden Green, Daffodil Delight, Crushed Curry - all by SU; Versafine Onyx Black. DIES: Stitched Oval (Lil' Inker Designs), Stitched Sentiment Strips (MFT), Flashy Florals (MFT). 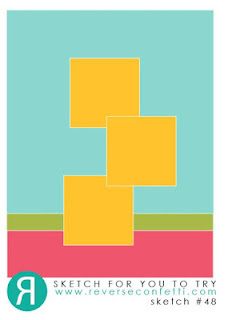 Wow...this is the last Monday in May already, so that means it's a different shaped card for the Mojo Monday Challenge. Julee has chosen a square layout, so I went with a 4 1/2" x 4 1/2" base. Since we're celebrating Memorial Day here in the US, I went with a sentiment that could be sent to someone who lost a loved one - whether they were in the military or not. I first did a watercolor wash over the background using Evergreen Bough, Cracked Pistachio and Fossilized Amber distress inks. I then stamped the fern images in the same colors. I wanted a softer look for the background, so covered it with heavyweight vellum. 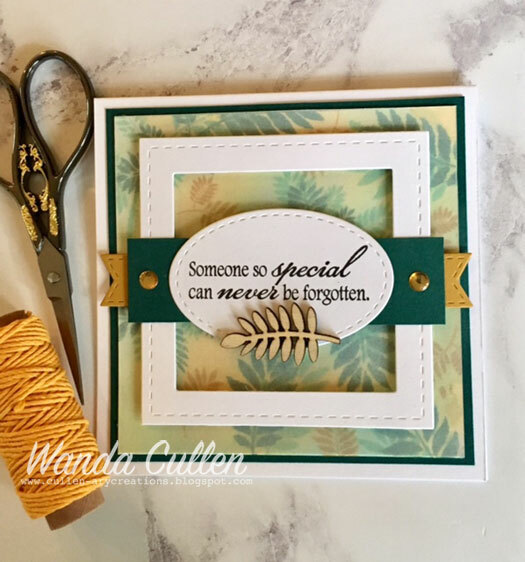 I thought it needed some kind of embellishment other than the two soft dot stickers, and happened to find this wood veneer fern in my stash. That seemed to be the perfect finishing touch. I used More Mustard and Forest Foliage (retired many years ago) cardstock - both by SU. STAMPS: Forever In Our Hearts (Verve). STAMPS: Mini Modern Blooms (MFT), Uncorked (MFT). PAPER: Iced Aqua (Reverse Confetti), Burgundy (The Paper Company), White (PTI), Brushed Silver (SU), Licorice by Bazzill Basics Patterned Papers. 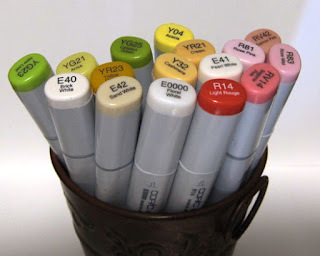 INK: Versafine Onyx Black, Always Artichoke (SU), Lime Green (RC), Flamingo (RC), Bumblebee Yellow (RC), Sunshine (RC), Rust (RC). 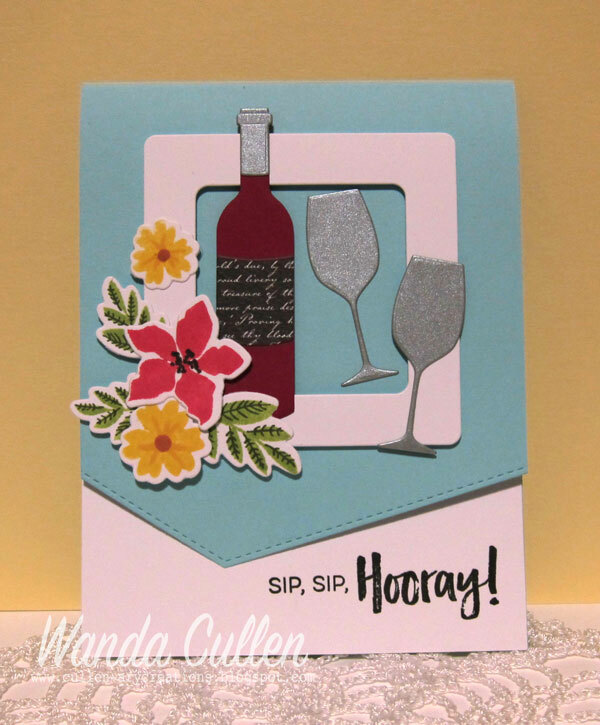 DIES: Stitched Basic Edges, Mini Modern Blooms, and Wine Service - all by MFT; Shakers 'n Frames by Reverse Confetti. The sentiment was gold embossed on heavy weight vellum then adhered using a very light spray of Elmer's Craft Bond spray adhesive. TIP: I lay the item I'm spraying on scrap paper inside my trashcan to avoid spray getting on things it shouldn't. 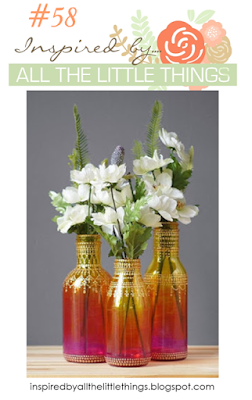 :-) The bottles were colored using Zig Clean Color brush markers. Here's hoping to see you in the Inspired By gallery! We'd love to have you join us! You can link up your creation to the challenge blog HERE. I had so much fun putting this little country scene together and it took 3 different stamp company products to git 'er done! 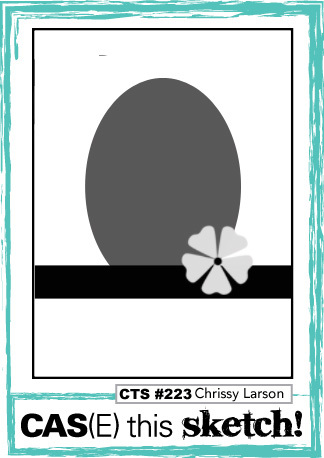 This uses the new layout for the Freshly Made Sketches Challenge and I'm combining it with the Furry Friends theme that is up for the Simon Says Stamp Wednesday Challenge. 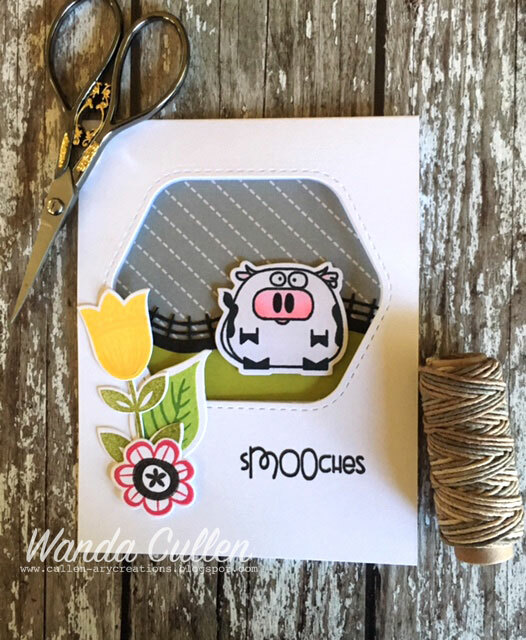 The adorable cow and sentiment are from Paper Smooches' Chubby Chums stamp set. The fence is the Rolling Hill Die-Namics die by MFT. 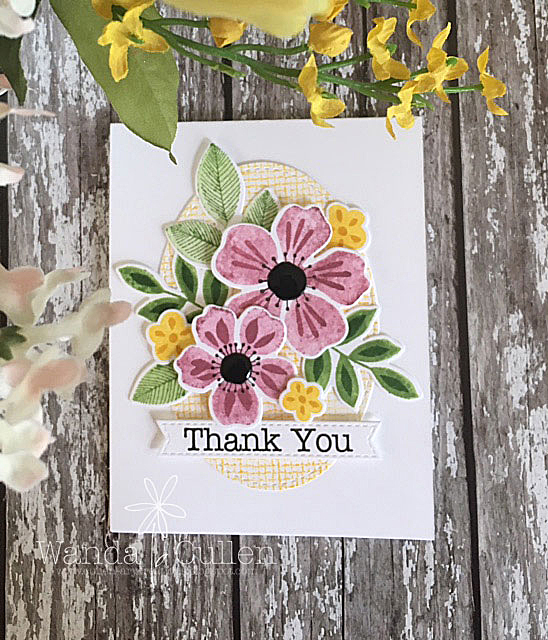 The florals are from Reverse Confetti's Blooms 'n Buds stamp set with matching dies and the stitched frame is also RC's newly released Hello and Thanks Label Confetti Cuts die set...LOVE it! Gotta run and head out to work shortly...thanks so much for stopping by and commenting! 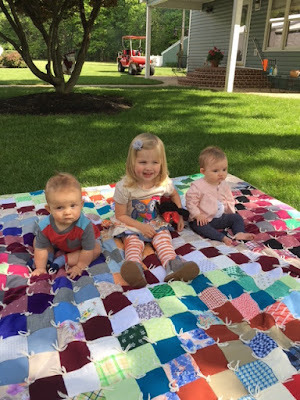 Welcome to the PTI May 2017 Blog Hop! We were given this photo for our inspiration and I must say...the colors were very different from my norm! I loved the watercolor look to the inspiration florals, so went with distress inks for the majority of my stamping. I used the 'rock and roll' technique so I could get two colors of ink included on the leaves. 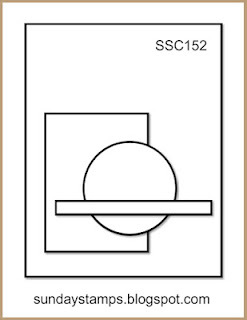 The sentiment was white embossed using Stampendous detail white embossing powder. STAMPS: Bitty Bouquets (PTI), Garden Grace (PTI). PAPER: Not Quite Navy (SU), Ranger Watercolor CS. INK: Tumbled Glass, Stormy Sky, Milled Lavender, Picked Raspberry, Tattered Rose distress inks by Ranger; Crisp Cantaloupe by SU; Versamark. 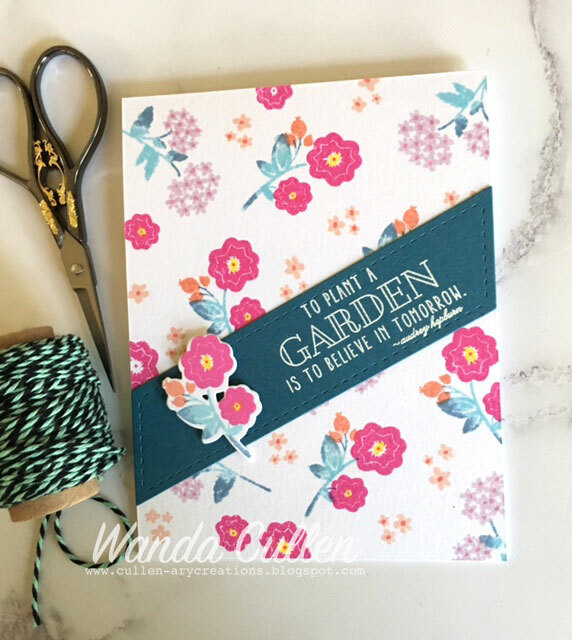 DIES: Stitched diagonal strip by Lil' Inker Designs; Bitty Bouquets by PTI. 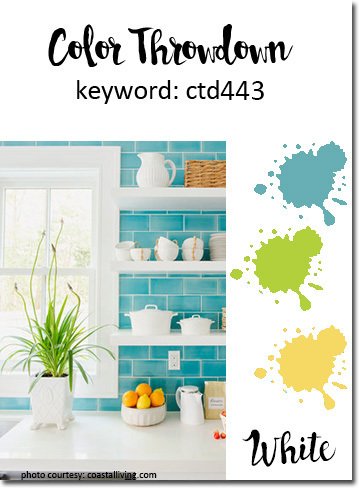 It's Wednesday and that means there is a new Color Throwdown Challenge! This was a unique color combination - green, gray and white - which I truly LOVED! 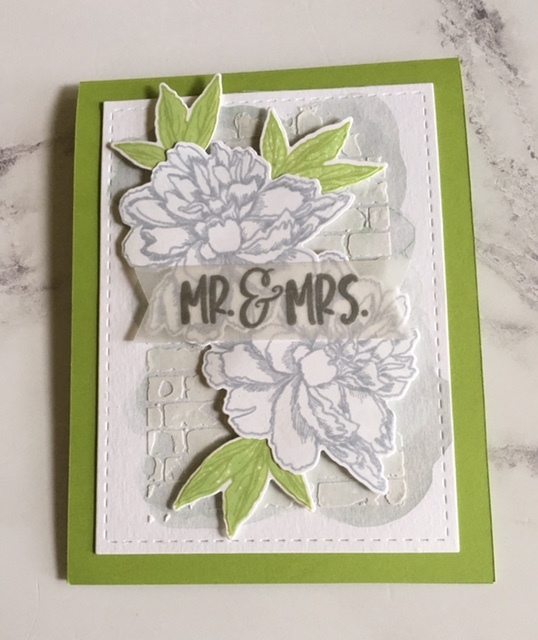 Having just gotten my first stamps from The Stamp Market (a new company this year), I knew I wanted to create some white peonies! 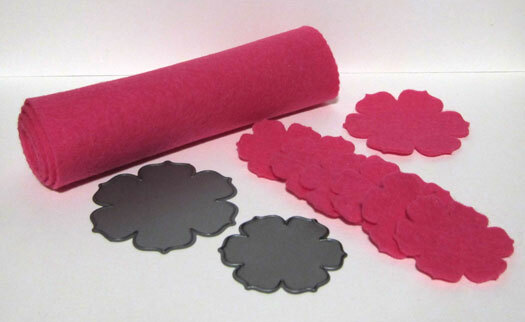 It meant two step stamping for the leaves and three step stamping for the flowers. The sentiment was silver embossed on heavy weight vellum after first die cutting a banner die by Reverse Confetti. I started with a Hickory Smoke distress ink watercolor wash on the base then added white texture paste using a Tim Holtz mini brick stencil. 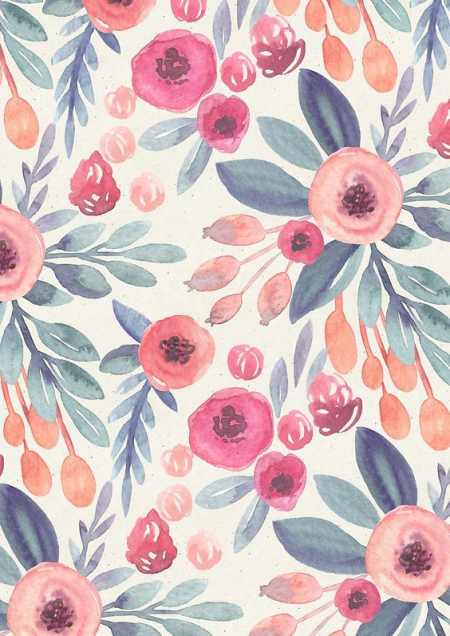 STAMPS: Pretty Peony (The Stamp Market). PAPER: Lime Green (Reverse Confetti); Ranger distress watercolor cardstock; Whisper White (SU). INK: Fairy Dust, Silver Lining, Beanstalk, Last Leaf - all by WPlus9; Versamark. DIES: Pretty Peony (The Stamp Market); Stitched Rectangle (Lil' Inker Designs); Tag It (Reverse Confetti). Good Monday everyone! Hope you are ready to kick off the week with another great sketch brought to us by Julee for the Mojo Monday challenge! I had several leftover pieces of gelli plate printing that I created last winter and thought the colors would work to add a pop of color to the kraft card base! I tore the edges then sponged with Tea Dye distress ink. 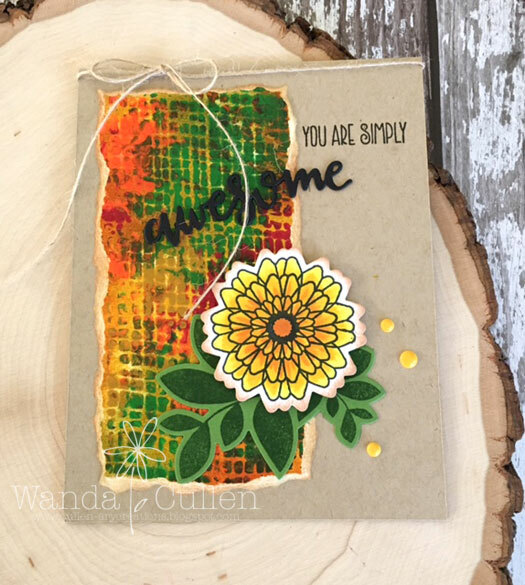 I used 3 different Verve stamp sets: Button Best (flower), Bloom and Grow (leaves), and Simply Amazing (sentiment). I also used 3 different Verve dies: Amazing Adjectives, Elegant Leaves and Petal Points. I added clear Wink of Stella glitter pen to the entire flower to give a subtle hint of shimmer. I managed to whip up this quick CAS design for the new CAS(E) This Sketch challenge by using some leftover elements from previous projects. 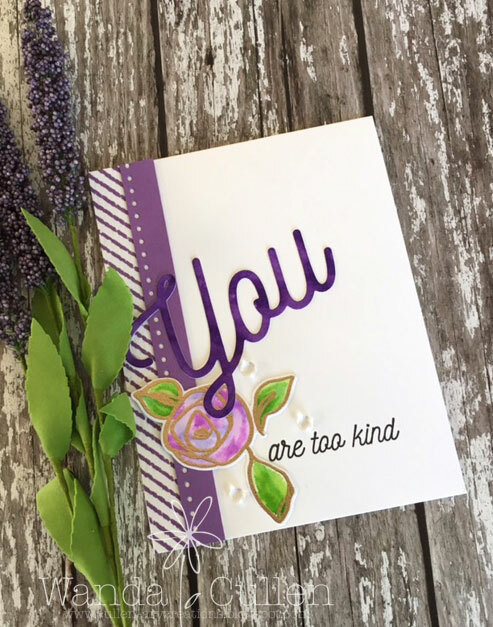 The striped border was stamped using MFT's diagonal stripe background and Grape Soda ink (Reverse Confetti). I used Grape Soda cardstock (RC) and die cut the open dotted border (RC's Edge Essentials). The gold embossed bamboo rose (Altenew) was colored with Zig clean color brush markers. 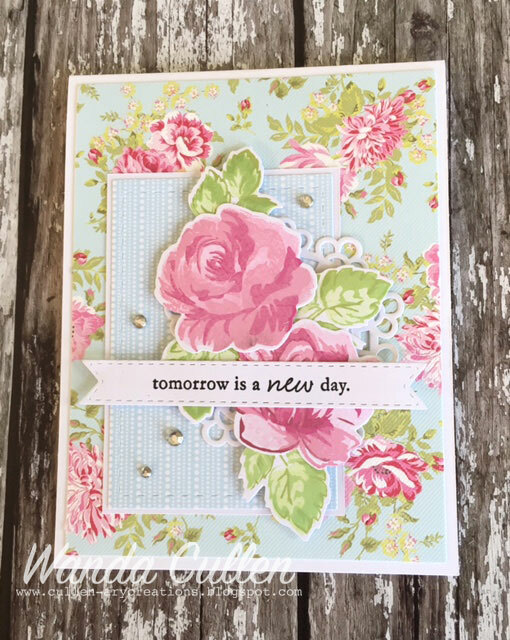 The only new items were the lovely sentiment stamp and die combo from The Stamp Market - called "You". I adhered some clear dew drop embellishments with SU's fine tip glue pen. Thanks for stopping by...I'm heading off to work in a bit. The weekend is here and for most people, that's a happy time! For me, it means my 8 days of staycation are over and I head to work this afternoon - sniff, sniff! 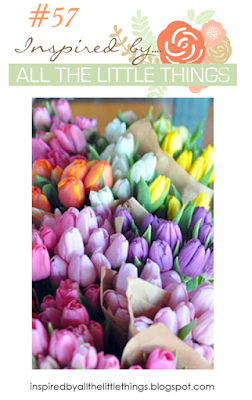 Since many of you are off, I hope you'll take time to join us for the Inspired By All The Little Things challenge! The colorful tulips in the photo are so gorgeous and I knew right away I wanted to color one of my favorite images with Copics. As is my norm, I stamped the image twice using a MISTI. You can currently get the Tulips in Hobnail Pitcher image through Marcella Hawley's Power Poppy company (it was released a number of years ago through Flourishes). STAMPS: Tulips For Friends (Flourishes). 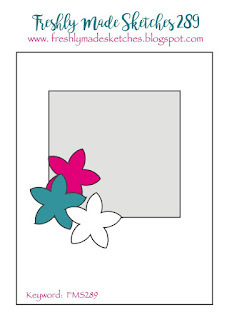 PAPER: Painted Blooms 6x6 pad by Penny Black; X-Press It Blending Card. DIES: Stitched Basic Edges Die-Namics by MFT; Stitched Circle by Lil' Inker Designs. Good Thursday everyone! I was up rather late last night finishing this card for the Freshly Made Sketches Challenge and for Simon Says Stamp Wednesday Challenge where the theme is "A Bit of Sparkle". I wanted to try some "loose" watercoloring which I always struggle with. The OCD side of me thinks I need to fill in the coloring space - lol - so it's difficult to leave white space. My sparkle elements are the gold foil stripes, gold embossing and clear sequins. I colored using Zig Clean Color brush markers. 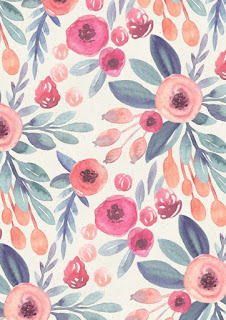 PAPER: Blush and Mint (Recollections); Ranger watercolor CS. 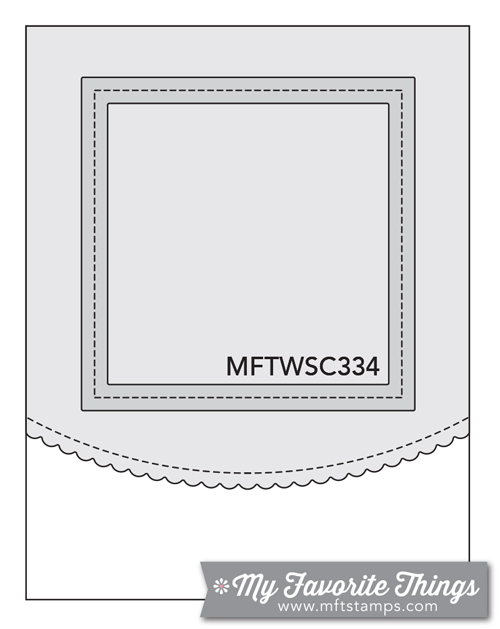 DIES: Bamboo Rose (Altenew); Stitched Rectangle (Lil' Inker Designs). 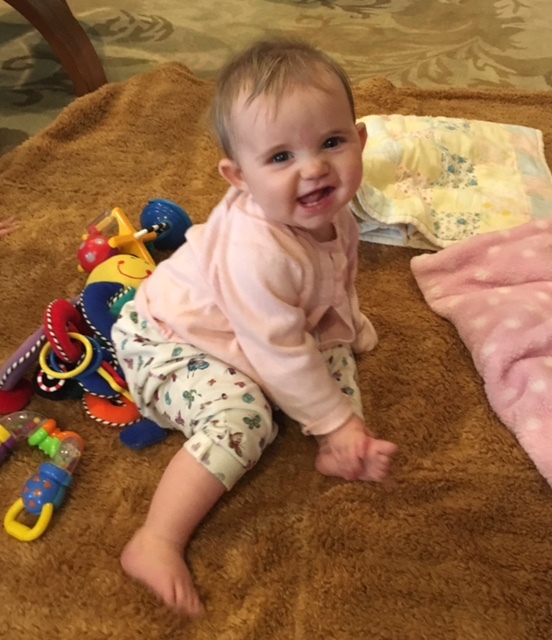 Hello blog peeps! It's Wednesday and that means a new Color Throwdown Challenge! LOVE, love, love Broni's colors she chose this week! They just scream summer to me and that means flowers and more flowers! 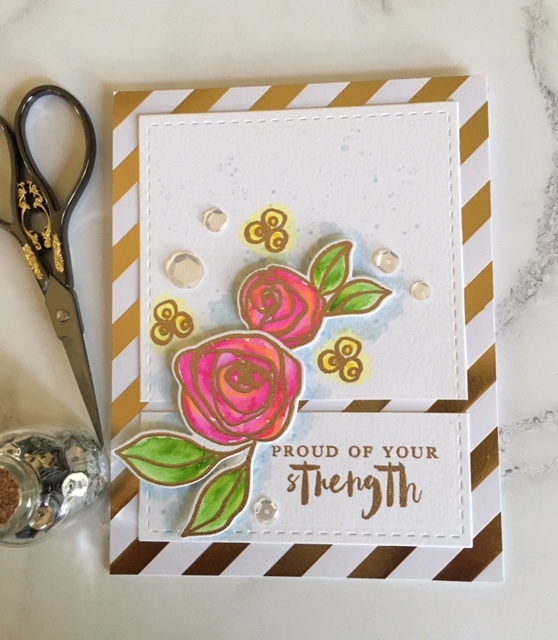 I took this week off to plant some flowers outdoors and while I was in my craft room, I planted more flowers on my card! 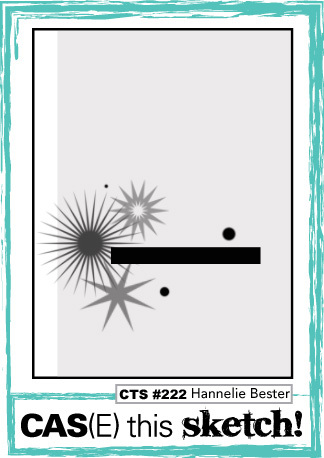 I'm also playing along with Reverse Confetti's May Sketch For You To Try. 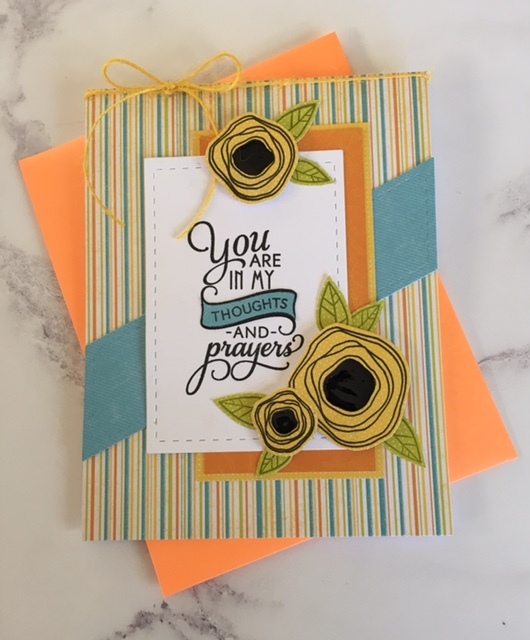 I was thrilled to see Reverse Confetti added four new inks in the yellow color family, so I went with all four in stamping the florals (Buttercup, Bumblebee Yellow, Sunshine, Rust). The leaves were stamped with Lime Green (RC) and Garden Green (SU). 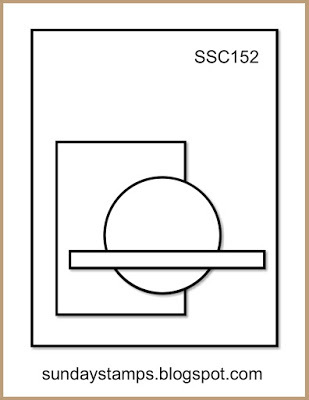 It took three inkings with my MISTI to get the Versafine Onyx Black ink to stamp well on the WC cardstock. Don't know how I lived without this tool! LOL! Victorian style wallpaper) with this great sketch design by my BFF, Teresa, over at Sunday Stamps. I started with a couple of patterned pages from FSC's "Pretty Posy" 6x6 paper pad. I discovered a handy layering guide on Altenew's website that helps so much with getting the 3 steps lined up properly with their Vintage Flowers stamp set. The sentiment banner die is from PTI's Tag Sale: Quilted Die and the sentiment is from PTI's Blooming Button Bits. 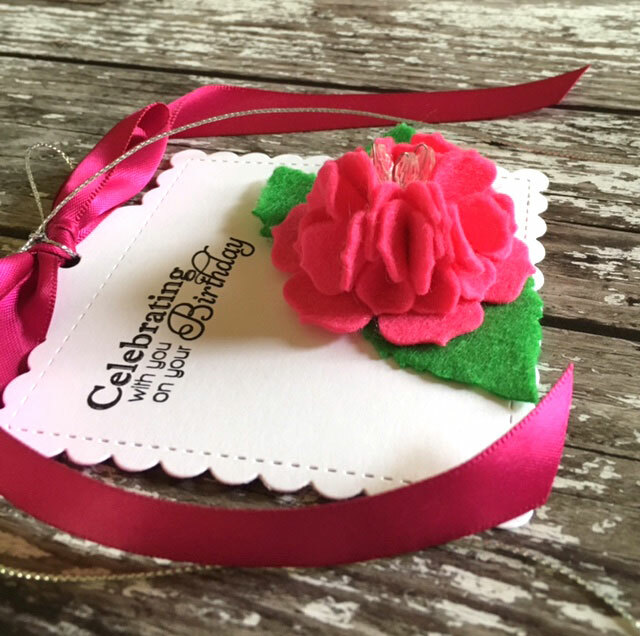 You can barely see the circle element, but I used a Martha Stewart doily tag. INK: Little Piggy, Sweet Gelato, Cranberry Crush, Beanstalk, Last Leaf - all by WPlus9; Versafine Onyx Black. Good Monday everyone! I was blessed to have a wonderful Mother's Day weekend with all three grandchildren together and now I can look forward to being off this week until the weekend! Doing the happy dance here! 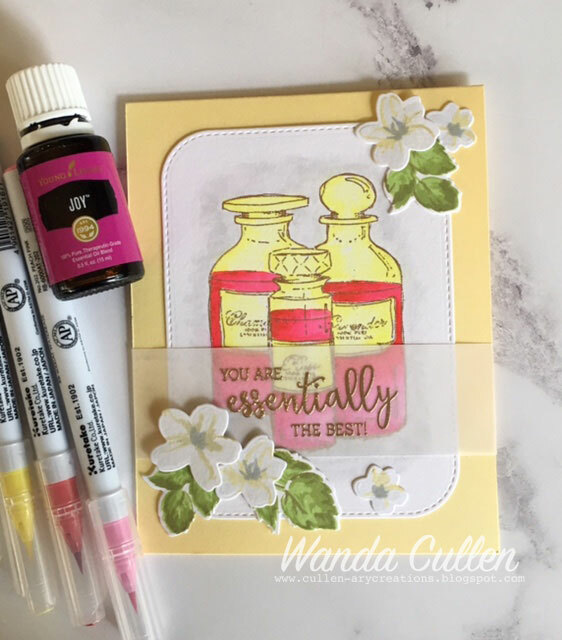 I needed a card for a lady who has gotten more bad news about her health, so that is what started the thought process for my card sample for the Mojo Monday Challenge. I used papers from The Citrus Mat Stack by DCWV. 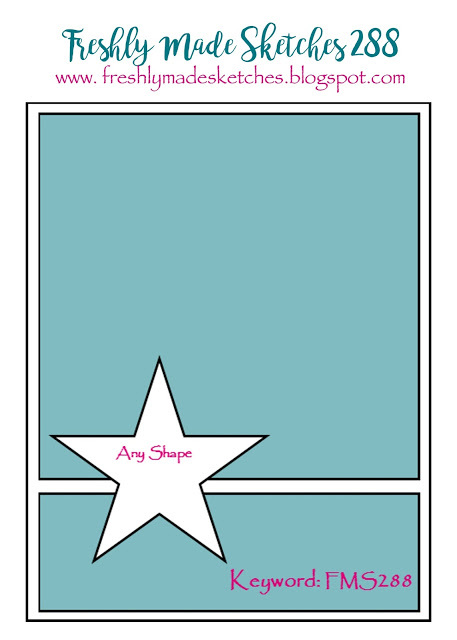 My diagonal stripe is opposite from the sketch, but that was the direction of my stitched die, so I went with it. :-) The poppies were fussy cut, popped with foam tape, then had black Enamel Accents added to the centers. Part of the sentiment was paper pieced. 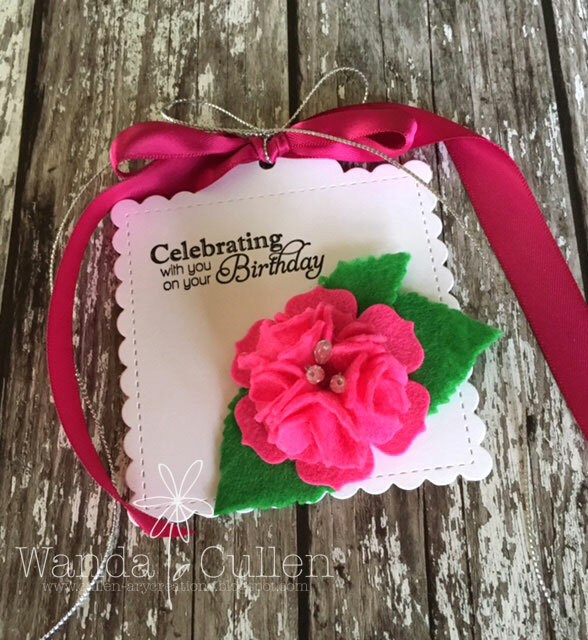 STAMPS: Poppy Birthday (Verve); Wonderfully Made (Verve). 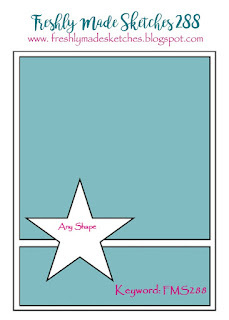 DIES: Stitched rectangle and Stitched diagonal stripe by Lil' Inker Designs. What you don't know is how funny this really is! Our one DIL was singing and dancing a super funny song and we adults were all cracking up. Two of the littles just weren't going for it - lol! They kept their serious little faces the whole time!